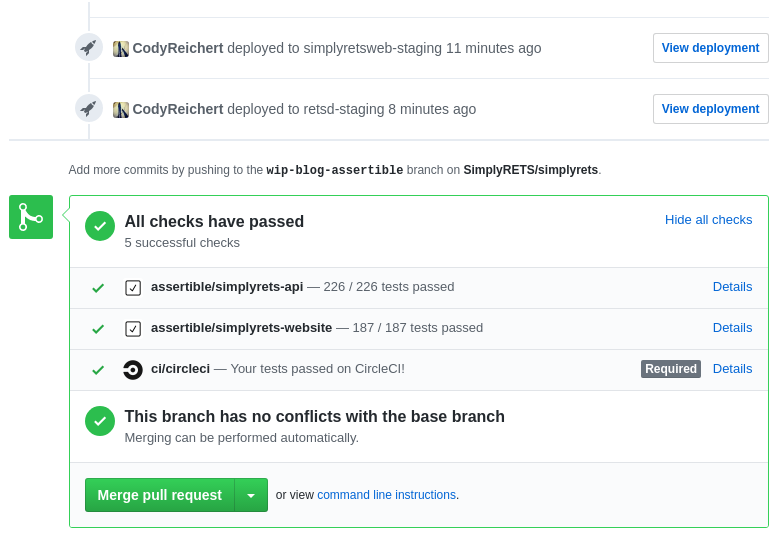 Behind the scenes at SimplyRETS, we focus a lot of our effort on testing to make sure our API, website, and other web services are always functioning properly. Our infrastructure relies heavily on continuously testing at each step of the development process. One of the tools we rely on the most is Assertible, a tool for testing and monitoring APIs and websites. We use Assertible to monitor and continuously test our API, website, blog, and any other web services in our infrastructure. We use GitHub to host our code and push all new features and bug fixes to Pull Requests. Pull requests are very a convenient way to manage proposed changes to our code. They also offer a ton of hidden features like GitHub Deployments and GitHub status checks. One reason we love Assertible is that it integrates directly with GitHub and utilizes these hidden features to improve the experience of building web services. Because of this strategy, we don’t have to worry about manually testing old features which allows us to focus on the features we are currently building without breaking something. While we also use unit tests extensively, we rely heavily on Assertible for integration testing and functional validation of our API release candidates. Scheduled monitoring is another critical component of our continuous testing strategy. We run our tests on scheduled intervals to monitor performance and availability to ensure everything always works and is not causing bugs for users. The same test-suites are reused in the post-deploy step mentioned above. Continuously monitor for functional defects that aren’t picked up by more simple monitoring services like Pingdom. We believe that scheduled monitoring is a critical piece of the puzzle and helps us track down bugs before our users hit them! This generally means confining the test to validate a single feature, regression, or bug. This is straight forward in our infrastructure. We limit our tests to a single interface and try not to make tests that rely on several services, when possible. This goes along with creating the smallest test possible. We’ve found that tests which rely on allocating too much data become flaky. While this is necessary sometimes, it’s important to only allocate the data that’s absolutely necessary to test a single thing. Testing is hard. Often, tests can become flaky or raise false-positives often. Because of this, we refactor and/or remove tests which are causing constant problems. When possible, we try to add tests at the unit testing level. Some of these approaches are described in more detail on the Assertible Blog in the 4 techniques to reduce API testing errors and improve your QA automation post.